While it would be nice if we all had elaborate and neatly organized craft rooms like you see in home and garden magazines – that’s just not always possible! If you struggle with organizing all of your supplies and finding room to work for your artwork, I thought I would share some of my ideas and tips to help you make a creative space to work in – no matter how limited your space or budget may be! You don’t need a huge amount of space for art journaling, but you DO need a space somewhere specifically for crafting/creating and keeping your supplies handy. Some will argue with me on this, but I’ve found that trying to do it at the kitchen table was a disaster – not only did I have to lay down newspaper every-time I wanted to create, but I had to clean up my projects and limit my time working on them to work around meal times. Finding a dedicated place to create was a must! So I started thinking about areas in my house that were used the least by my family. No one ever really spent any time in the living room, so that was the most logical space to set up, even though it’s an unconventional space for a craft studio! We had an old folding table in our garage from when I used to sell at flea markets, so we brought that into the living room and set up some chairs around it. You can purchase folding tables for about $40 at most retail stores, or you can try finding a used table on sites like Craigslist, Freecycle, etc. Best of all, now all of my stuff can stay put and me working on a project doesn’t have to revolve around meal times or trying to clean up stuff right away – I can take my time on creating a page, working on sections of it during different parts of the day. No place for a folding table in your house? Think carefully about how you have furniture arranged in a room. What would happen if you moved a couch or bed to a different side of the room or at a different angle? Space planning isn’t my greatest strength, but you’ll be amazed what rearranging some furniture can do in opening up space you might of otherwise missed. Closets also make for good work spaces if you have one that you can empty and place a desk or small table into. As a matter of fact, my desk for doing all of my digital creating is in a closet! On my desk I have my printer/scanner, an external hard drive, and my laptop. Oh, and headphones, because I LOVE listening to music while I work! Once you find your dedicated space for working on your projects, the next step is organizing your supplies. There are a number of things you can do to create an organized creative space for making art! Investing in a Few good storage pieces is worthwhile, as it can serve you for many, many years to come! Cereal Boxes: Cereal boxes have a zillion uses in art journals, and they are handy for storage and using space wisely too. You can create a drying rack out of cereal boxes, or you can also store other types of papers in them. Or, cut off one side and turn it into a tray to hold things like stamps, clips, or other loose objects. Cups: I always save the kid’s cups we get from restaurants and over the years we have accumulated quite a lot of them! They make a great solution for holding paint brushes, scissors, pencils and pens, markers, etc. etc. Food Containers: Start saving all of your containers with lids you get from the foods you buy. These are a great way to store buttons, stamps, textures, fabric swatches, and more. Boxes: You can often get free boxes from the grocery store, or you can save them from purchases you make online. Boxes are great for storing finished projects, magazines for collages, creating shelves underneath your folding table, and more! Jars: Jars are great for a number of things. Use is to hold water for cleaning your brushes, for holding scissors, for keeping buttons. Definitely start saving those jars! Small Briefcase/Suitcase: If you happen to have a small suitcase or briefcase, this can be a great way to store things like markers, paints, brushes, etc. etc. if you will need to regularly clean things up and put away your supplies. It’s also handy to have for traveling. Inexpensive Storage Rolling Cart Bins: You can find plastic/metal rolling cart bins with drawers rather inexpensively at just about any big box retail store. Some supplies you will be using again and again in your projects – these are the ones you want to keep readily accessible – within arms reach of your creative space when you sit down to create. Others you may not use as often – keep those ones tucked away in a drawer or storage box. 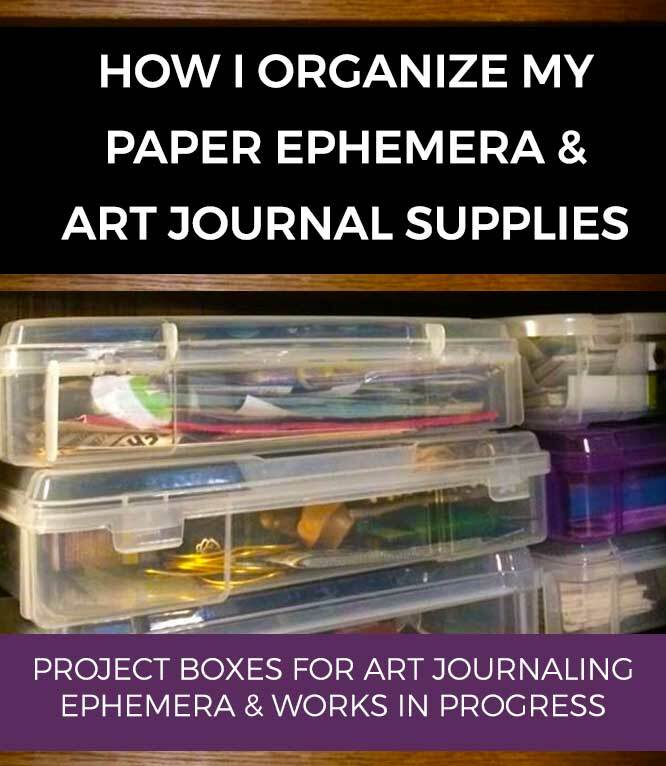 It’s easy to become a hoarder of art supplies, especially when you start collecting things from around the house for making art journals! Accept that some things may never get used, so know when it’s time to let go and pass them on to another artist or donate them or otherwise find a way to recycle them. There are a number of creative things you can do to create storage space for your art supplies – and they don’t have to be boring! Think over the door hangers for shoes to hold things on a closet door, an old TV cabinet, a dresser – all these things can be potential storage solutions for your artwork. 4. Always Keep Your Table Clear! Start making it a habit to clean up art supplies when finished working with them. You don’t have to do a perfect job, but you’ll want to make sure your space is cleared off enough that you can be creative next time you want to make art. It’s not much fun when you have to clean up a mess just to start a new project! How Do You Stay Organized When Organizing Your Art and Craft Supplies ? It can be a lot of fun to see how different artists organize their creative spaces. I would love to hear a little about your craft room organization ideas for how you stay organized in your creative practice! 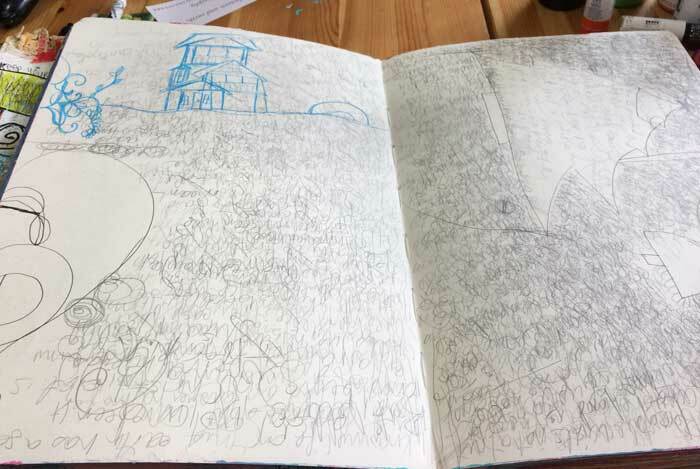 Do you have any tips you would like to share about creating an organized work space for art journaling? How do you keep your supplies and projects organized? I’d love to hear your ideas in the comments below! Your last tip was the best one. I find that if I pile a lot of stuff on my work table, I am really uninspired to make art. Lately, I have been trying to tidy up after a session. When I go back to a nice clean space, I can lay out new projects more easily and I don’t have to keep moving stuff out of my way. Dont forget to keep cans also that food comes in peas and corn cans and huge tomato juice cans I cover them with duct tape and wahla a storage can. Pizza boxes with wax paper in the bottom of storage of my 12×12 scrapbook paper. neat and organized. Also tape or glue several different size boxes together and cover with contact paper or scrapbook paper and you have an organizer for the desk or mail.